Walking on the mountains and spending from a couple of hours, a day or even a week or more in the middle of nowhere is a perfect setting for slowing down, relaxing, challenging yourself physically and getting in close touch with nature. Which do you prefer, hiking, trekking or mountaineering? 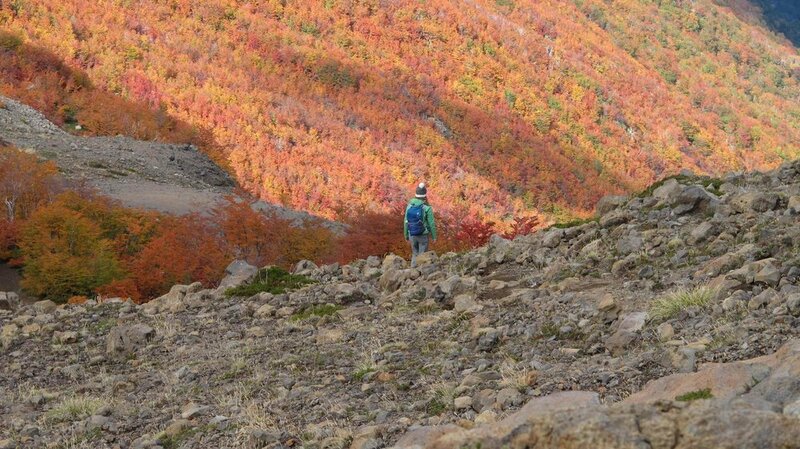 Trekking and hiking both involve walking, but there are some differences between them. Hiking is leisure walk compared to other sports. It is walking on well-made and wide trails. The main aim is to enjoy nature, scenic views, roam in the forests, climb up an easy mountain or hill. It does not require much gear and it is usually a one day activity. Trekking on the other hand, it is usually a longer and harder hike. It is an adventurous journey undertaken on foot on the mountains or in areas where common means of transport are not available. Trekking is more vigorous and done with a purpose to achieve something or to reach somewhere. Mountaineering is the whole set of activities that involves ascending mountains. Mountaineering-related activities include traditional outdoor climbing (rock and ice), hiking, backpacking, skiing, and traversing via ferratas. What makes hiking and trekking so fun? Trekking is an amazing way of "traveling" by foot, enjoying stunning views, done with the purpose of reaching somewhere and getting in close touch with nature! How to start? Look for any mountaineering or backcountry organisation close to you. All these places will provide anyone introductory courses and weekend "escapes", avalanche classes, orientation classes and more! Joining a mountaineering club will also be a great chance for you to meet new people! Avoid going out alone if you have no experience and do not forget to always make sure to tell someone where you’re headed and for how long! Physical Intensity: demanding - specially on multi-day adventures. Risk Level: low - even though you should have some notion about orientation, navigation and maps and basic mountain weather conditions. What to buy? a good pair of trekking shoes is essential! Remember not go for a long, multi day hike, without wearing them first. — Kilian Jornet Burgada, mountain lover, runner, alpinist and skier. How long is the trekking and how fast you can progress? Defines time. What is the weather like? Is it going to be hot, cold, wet? Defines clothing. What is the distance? What is the terrain like? There is water on the way?Defines type of shoes and food resources. How many people? More people means less weight to carry for everybody. At what altitude? Defines risks, clothing and level of preparedness. Regarding clothing, always plan to dress in layers and don’t bring cotton along with you. As soon as you will get warm, you will be sweating and cotton does not dry fast enough. Water bottle and water purification system if needed. Stay as light as you can! Remember you will have to carry all the gear with you! Wear nylon or moisture-wicking socks. Make sure your shoes fit properly. Shoes shouldn’t be too tight or too loose. Generously apply vaseline (petroleum jelly) to problem areas and to your feet before putting on your socks and before starting to walk. This helps to reduce friction when your skin rubs together or rubs against clothing. — Oscar Wilde, Irish poet and playwright. From Wilde’s essay "The Soul of Man". How to prepare for a trekking adventure? When it comes to hiking, trekking and mountaineering, you have to be conscious about your physical condition. That is not a question anymore of being in shape or not, but really understand how is your heart, do you get vertigo in heights, do you get dehydrated easily, etc. Our recommendation is that you get physically and mentally prepared with your objective. If it is a long trek in Nepal you are pursing, start at least 6 months in advance and focus on the adventure with your body and mind. Both need to get to Nepal well prepared. You can get mentally focused by visualising the challenge ahead. Plan to exercise at least 3 to 4 times per week at least 40 minutes each time. Walking, biking, running or even swimming. Most importantly, make leg based cardio your routine! Take the stairs every chance you get! Once you think you are ready, plan a short hike or maybe even an over night one. Do not overweight your backpack the first time, that is how you will prevent yourself from a back injury. Anything above 15-20 kg is heavy! Make sure you’re walking properly and practise on different types of terrain as much as possible. Avoid training solely on level footpaths and roads. Instead, try to train on surfaces that will be similar to the trails on the trek. We recommend using walking poles. Keep yourself well hydrated, always! Finally, stretching is very important! Make sure you always stretch after exercise. Practising yoga also helps! Mountains are majestic, full of hidden spots and stunning views. Always approach mountains well-prepared, bringing enough clothes, checking the weather forecast and doing treks and hikes within your level of ability!